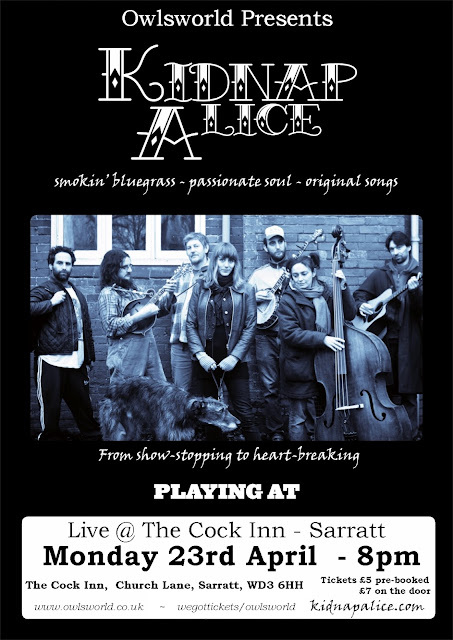 I'm very excited about this gig, as we have my lovely friends Kidnap Alice coming to play at this cosy venue whilst on their 2012 UK tour. Kidnap Alice are based in London but hail from the South West and South East of England. They mix up classic Bluegrass and 'Old Time' tunes with a modern twist and give their own original songs the Bluegrass treatment with fiery mandolin, blistering banjo and slapped bass. With soulful vocals and tight arrangements from a classic acoustic string band line up, the band bridge the gap between vintage Rhythm & Blues and Appalachian mountain music. The band made their début festival performance at Glastonbury 2010, opening the Club Da Da stage for the legendary Thursday Night HoeDown. Then, in true Glastonbury spirit, they busked another 6 shows around the site, including a super rowdy gig in the dug-out Piano Bar late on Sunday night to close the weekend! Since then the band have performed at numerous festivals and events including Camp Bestival, The Big Chill, Green Man, Bestival, Secret Garden Party, The Alternative Village Fête at the National Theatre and Shakespeare's Globe amongst many others.